THE HAGUE - The time that the participants of the semi-annual Interparliamentary Kingdom Consultations (IpKo) on both sides of the ocean would grab each other by the neck seems to be definitely over. The delegation leaders today only have compliments for each other and the positive atmosphere at the official closing of the summer edition. That has been different in the past. At the beginning of the week, it was by no means certain that the parties would return home as satisfied. 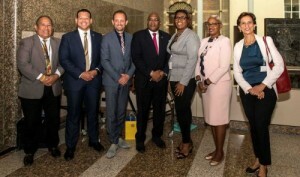 On Monday the Members of Parliament of Curaçao, Aruba and Sint Maarten had to sharpen their knives in a tripartite meeting. Reason: the after 8 years stagnating still not settled dispute regulation and the awkward statement of Undersecretary Raymond Knops of the Interior and Kingdom Relations that there is no hurry to introduce this bill. Chairman of the parliamentary committee for Kingdom Relations Alexander Pechtold noticed the reaction: Knops was therefore already asked for clarity about his planning for IpKo. His answer was, besides being vague, also formulated in such a way that the four delegations displayed a rarely unanimated consensus to emphasize their dissatisfaction. They were therefore quick to assume that the Undersecretary would be urged urgently ("I call it an instruction", according to the Sint Maarten’s Parliament chairwoman, Sarah Wescot) to present a timetable before June 18 and the Kingdom Act for the settlement of disputes at the latest November 1 for parliamentary treatment. The Dutch MPs shared the indignation which did the Caribbean delegations well. In the final press conference after signing the appointment list, all delegations called the joint response to Knops the highlight of the IpKo. Senator Ruard Ganzevoort, leader of the Dutch delegation, added a second highlight: there was no low point. And indeed there has not been an unspoken word, not even behind the scenes. Even within the delegations it was peaceful; the polarization virus was left behind in the Caribbean. Some of the relevant issues discussed during the IpKo were the sustainable development goals, election monitoring and the consequences for the islands of the unrest in Venezuela. The most important value, IpKo chairman Pechtold said, is that parliamentarians from the four countries were able to get to know each other more informally and individually.